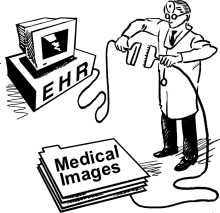 Since the accelerated acceptance of electronic health records (EHR), brought on by the adoption of the Affordable Care Act, patient records have existed separate and apart from their related medical images. There is no doubt that physicians unanimously believe that an integrated view of your medical image together with the textual description of your symptoms, test results and diagnosis would be more valuable than either of them separately. So, why do they remain detached? Why does EHR PACS integration matter? Electronic Health Records (EHR) and Picture Archive and Communication Systems (PACS) have followed very different paths resulting in structures that inherently don’t play well together. In fact, the original development of the first EHR and PACS were separated by over twenty years and several technological generations.